Live Oak Media. PAPERBACK. 1595193316 Good Condition. Has a small amount of writing/highlighting. Five star seller - Buy with confidence! . Good. Live Oak Media. PAPERBACK. 1595193316 Very Good Condition. Has some wear. Five star seller - Buy with confidence! . Very Good. Aladdin. Paperback. 0689839324 Please allow 4 - 14 business days for Standard shipping, within the US. Thank you for supporting our small, family-owned business! . Fine. 2000-01-01. 2002-07-02. New. Ships with Tracking Number! INTERNATIONAL WORLDWIDE Shipping available. Buy with confidence, excellent customer service! 2001-04-06. New. Ships with Tracking Number! INTERNATIONAL WORLDWIDE Shipping available. Buy with confidence, excellent customer service! 1975-04-01. New. Ships with Tracking Number! INTERNATIONAL WORLDWIDE Shipping available. Buy with confidence, excellent customer service! New York: Holiday House, 1937. Original pictorial boards, cloth spine. Date from OCLC/WorldCat. On last page: "Design by Helen Gentry. Printing by Willam E. Rudge's Sons for Holiday House.". First Holiday House Edition. Hard Cover. Very Good. Illus. by Woodcuts By Ilse Bischoff. 1998-06-06. New. Ships with Tracking Number! INTERNATIONAL WORLDWIDE Shipping available. Buy with confidence, excellent customer service! 1992-02-03. New. Ships with Tracking Number! INTERNATIONAL WORLDWIDE Shipping available. Buy with confidence, excellent customer service! 2008-09-02. New. Ships with Tracking Number! INTERNATIONAL WORLDWIDE Shipping available. Buy with confidence, excellent customer service! 1999-03-05. New. Ships with Tracking Number! INTERNATIONAL WORLDWIDE Shipping available. Buy with confidence, excellent customer service! Np: Rand McNally & Company, 1975. 1st Rand McNally edition. First printing, 1975. White printed paper over boards. F/NA. Tasha Tudor. pp. This is a FINE copy of the first enlarged edition illustrated by Tudor. This copy is rare with two related signatures: Tudor's on the half title, and her long-time friend and patron Ned Hills on the title page. He signed a personal "To Lois from Ned Hills" with a blue marker. This is the only book we've seen that he inscribed. "T. Tudor" in black ink on the half title. Hong Kong: Harper Collins Publishers. Fine+ in Fine+ dust jacket. 2002. First Printing; Signed by Illustrator. Hardcover. 0060081600 . A nice first edition/first printing in Very Fine condition in alike dust-jacket. SIGNED "Mary Engelbreit 2002" by illustrator Mary Engelbreit on first free end page; The children's Christmas classic "The Night Before Christmas" is written by Clement C. Moore and signed by illustrator Mary Engelbreit. Illustrator began her career with greeting cards that became an instant success, and is now known for her charming and distinction images. This book "positively glows with the sense of wonder, spirited wit, and nostalgic warmth that is her signature around the world". This book "positively glows with the sense of wonder, spirited wit, and nostalgic warmth that is her signature around the world". This book "positively glows with the sense of wonder, spirited wit, and nostalgic warmth that is her signature around the world". This book "positively glows with the sense of wonder, spirited wit, and nostalgic warmth that is her signature around the world". This book "positively glows with the sense of wonder, spirited wit, and nostalgic warmth that is her signature around the world". ; Color Illustrations . New York, NY, U.S.A.: Harper & Row. Fine in Fine dust jacket. 1963. First Edition; First Printing. Hard Cover. A very nice copy of this Original first edition of the Christmas Nutshell Library in Fine condition in alike Fine dust-jacket; "A poem that always brings delight, interpreted by Mr. Knight". 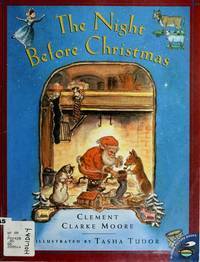 (from the dustjacket of the original edition) The children's Christmas classic from famous Eloise illustrator Hilary Knight, issued as part of the famous Christmas Nutshell Library; Christmas Nutshell Library . 2001-09-08. New. Ships with Tracking Number! INTERNATIONAL WORLDWIDE Shipping available. Buy with confidence, excellent customer service! 1999-03-07. New. Ships with Tracking Number! INTERNATIONAL WORLDWIDE Shipping available. Buy with confidence, excellent customer service! Chicago: John C. Winston, 1942. First edition with Shinn's illustrations. (no additional printing). Hard Cover. vg/vg. Color pictorial covers and endpapers. Many color and black and whtie illustrations Many color and black and white illustrations by Everett Shinn. In a color pictorial dust jacket. (lightly chipped dj). In a mylar protective wrapper. Troll Communications, 1989-06-01. Pop. Hardcover. Used:Good. Philadelphia: John C. Winston Company, 1942. very good hardcover. Illustrtaed by Everett Shinn. 1942. Previous owner inscription.. Hard Cover. Very Good/Good. Illus. by Shinn, Everett [illustrator]. Running Pr Book Pub (J), 1989-12-01. Hardcover. Used:Good. New York: Grosset & Dunlap, 1937. Book. Illus. by Thelma Gooch. Very Good. Hardcover. 1st Edition. 4to - over 9¾ - 12" tall. Pictorial boards clean and bright. Spine heel with a bit of rubbing, bumped. Binding firm, no breaks or cracks. Contents clean and bright, unmarked. DJ not clipped (5050) top edge of front panel with 3" square hinged-closed tear, accompanied by creasing within affected area. Illustrated jacket still clear and visible in this area. Edges gently rubbed with some light bumping. A clean and nice copy, despite minor defects. Photographs available upon request..
2011-08-03. New. Ships with Tracking Number! INTERNATIONAL WORLDWIDE Shipping available. Buy with confidence, excellent customer service! 2016-08-08. New. Ships with Tracking Number! INTERNATIONAL WORLDWIDE Shipping available. Buy with confidence, excellent customer service! 2013-07-06. New. Ships with Tracking Number! INTERNATIONAL WORLDWIDE Shipping available. Buy with confidence, excellent customer service! 2016-09-15. New. Ships with Tracking Number! INTERNATIONAL WORLDWIDE Shipping available. Buy with confidence, excellent customer service! 1989-07-09. New. Ships with Tracking Number! INTERNATIONAL WORLDWIDE Shipping available. Buy with confidence, excellent customer service! 2001-10-01. New. Ships with Tracking Number! INTERNATIONAL WORLDWIDE Shipping available. Buy with confidence, excellent customer service!